Yea, you don’t to watch this review. They are all over the place, talking over each other. Gawd. To many spoilers. They are also sounding like whining kids continually asking why. There are lots of questions, but c'mon. And they have some legit bashes. Some I agreed with, others were just whinny. I had to turn this off. I do want to add some links here. They are definitely spoiler intensive and should not be looked at until after you see the movie. But I guarantee, some of the discussions here will want to make you go back and watch it yet again. I think there is a lot more going on in this movie with a first watch. These discussions at the very least will spark some thoughts beyond it being a prequel/sci-fi/horror movie. Lately, the Rad Guys have been doing that a lot...talking over each other. The 4 day reviews from E3 2012 were particularity frustrating getting through. I really wanted to punch them each in the face. Usually they are respectful enough to give the other guy some room and time to talk. Apparently this is the new format for them I guess. 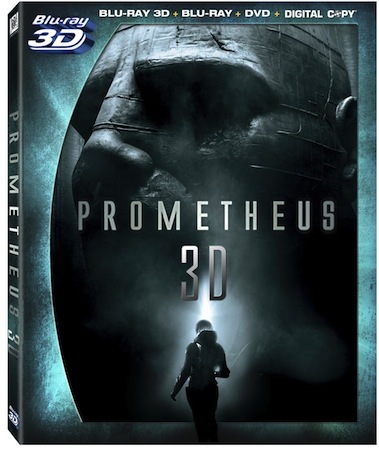 While Ridley Scott's Prometheus is still in theaters, it's been available for preorder on Blu-ray 3D since before the flick debuted, and now Amazon France has exposed the full list of extras on the way. The bad news, pointed out by Movies.com and Prometheus Forum, is that those anticipating a classic Ridley Scott Director's Cut to fill in plot holes appear to be in for a disappointment -- while there are 15 minutes of extended / cut scenes, there's no indication that you'll be able to watch the movie with them reinserted. There are a lot of other extras, including a director's commentary, extensive making-of featurettes, many of the short viral videos that were posted previously and production materials, along with a Second Screen iPad app. The specific set listed includes the other Alien flicks, but since we're sure you've already snagged the Anthology with its MU-TH-UR interactive mode you'll probably be looking for a more limited release. The release date for the set remains October 9th, hit the source link for the listing or check out the full list of features and a trailer after the break. for you sonzabi tches that haven't seen it YET!!!! Simply put, Prometheus is the most divisive film of the summer. The Internet’s anticipation had been at an all-time high for years leading up to its release, so when the film didn’t end up being “the greatest thing ever!” more than a few people came away disappointed. From a wonky third act to a few head-scratching character decisions, much of the film’s problems were laid upon co-writer Damon Lindelof‘s Twitter feed. In terms of what didn’t work, many labeled the movie “Lostian.” Now, Lindelof is discussing those issues and critics, with the exception of the ones that actually matter. There’s been some legitimate criticisms made over Ridley Scott‘s return to science fiction, but Lindelof doesn’t appear to be all that interested in discussing them…or perhaps no one has simply asked him about them yet. In an interview with the SpeakEasy blog at the Wall Street Journal, Lindelof (kind of) talked about the reception of Prometheus. Unfortunately, he never went beyond declaring the divisiveness a case of “I love ambiguity and you guys just, I dunno, don’t!” Even as a big fan of Prometheus who has no problems with the film’s ambiguity, Lindelof’s stance comes off mildly dismissive of the film’s biggest critics. Planets and star systems? Why not focus on or discuss having your God/creator act like nothing but a mindless brute? Or the problem with Elizabeth Shaw spelling out the main moral of the film at the very end? Or, hell, why one frightened nerdy scientist was so open to saying hello to that lethal alien? Aren’t those parts – logical character decisions, subtlety, etc. – a tiny bit more important than what you name your star system? I'm a sonsabeetch, so why would I open that spoiler? Bah! Not falling for the 'banana-in-the-tail-pipe' trick. I haven't posted about 50% of the stuff I had because of spoilers... because SOMEONE hasn't seen Prometheus yet. This is only the tip of the iceberg of the discussions and blogs following the theater release. Yay! I can now go back and dissect this thread and read up on stuff that I refused before.